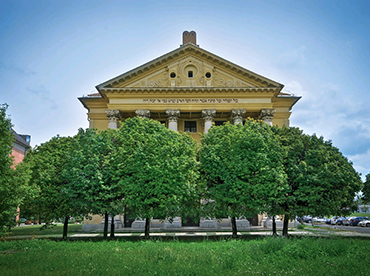 The Obuda synagogue is the oldest functioning synagogue in Budapest, which was repossessed and rededicated to it original function through the efforts of the Jewish community. Such an achievement is unique in Hungary and perhaps in all of Europe, since its rededication, the synagogue serves not only as a house of worship, but as a community and a cultural center as well. Although there is documented evidence of Jews living in Obuda already from the year 1 349, we know very little of the life of the community. Since the settlement decrees passed by Maria Theresa of the Habsburg Empire did not give rights to Jews to settle in Pest or Buda, Jews were forced to settle in the cities’ outskirts, under the protection of local aristocrats. Obuda was one of such places, where the Jewish community was established and flourished. The first time when Jews were allowed to build a permanent synagogue was in the 1 8th century. The building that is in use even today was inaugurated on July 20th of 1821. Even during these times, Jews were not allowed to settle in Buda, therefore they lived on the nearby estates of the Zichy family, mainly around what was than called the Jewish street (today Lajos street). The building was planned by architect Andras Landherr, while the interior was created by Janos Maurer. 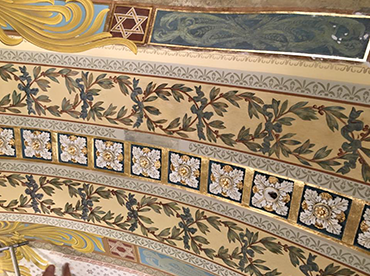 It was considered one the larg­est synagogues of its time in the Habsburg Empire, and was renovat­ed in 1900, that is when it received its secession ornaments. WW2 almost completely destroyed the community in Obuda as well. 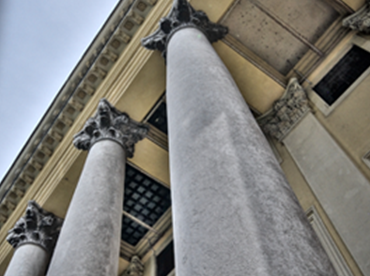 Those who remained or returned were able to save the synagogue for another year or so after the war, but in the early 1950s the building was confiscated by the state and became a protected monument in 1957. It served various purposes in the second half of the 20th century and was used as a museum, refugee home and lately as a studio for the Slate Television. The outside was kepi in its original form, the interior however was rebuilt and redesign over and over again. The synagogue has regained it original use in 2010, when EMIH (Egységes Magyarországi Izraelita Hitközség – Unified Hungarian Jewish Community] was able to reclaim the building as a result of unprecedented communal effort. Renovations started to take place than, completely financed from private donations and they are still ongoing upon available funds. On the eve of the Jewish New Year of 5770 (September 10. 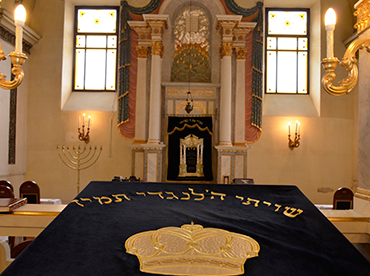 2010] the synagogue was rededicated and daily Jewish life has start­ed again in Obuda. Minyanim (congregation of 10 adult Jewish males required for communal prayer services) gather every weekday and on the Sabbath and Jewish Festivals, apart from different celebrations, family events, children and family cultural programs. Get to know the oldest functioning synagogue in Budapest, which has become the symbol of the reviving Hungarian Jewish community! The synagogue is maintained and continuously renovated from private and community funds? The complete renovation is yet far away. 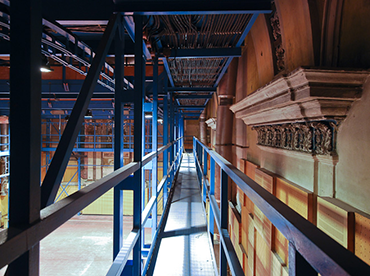 Your donation can be of great help to restore the original beauty of the building and the community life! Thank you for your generous support! 1052 Budapest, Károly krt. 20. Hungary, Budapest H-1036 Lajos utca 163.